American diplomat, statesman and scientist, born on the 17th of January 1706 in a house in Milk Street, opposite the Old South Church, Boston, Massachusetts. He was the tenth son of Josiah Franklin, and the eighth child and youngest son of ten children borne by Abiah Folger, his father's second wife. The elder Franklin was born at Ecton in Northamptonshire, England, where the strongly Protestant Franklin family may be traced back for nearly four centuries. He had married young and had migrated from Banbury to Boston, Massachusetts, in 1685. Benjamin could not remember when he did not know how to read, and when eight years old he was sent to the Boston grammar school, being destined by his father for the church as a tithe of his sons. He spent a year there and a year in a school for writing and arithmetic, and then at the age of ten he was taken from school to assist his father in the business of a tallow-chandler and soap-boiler. In his thirteenth year he was apprenticed to his half-brother James, who was establishing himself in the printing business, and who in 1721 started the New England Courant, one of the earliest newspapers in America. Benjamin's tastes had at first been for the sea rather than the pulpit; now they inclined rather to intellectual than to other pleasures. At an early age he had made himself familiar with The Pilgrim's Progress, with John Locke, On the Human Understanding, and with a volume of The Spectator. Thanks to his father's excellent advice, he gave up writing doggerel verse (much of which had been printed by his brother and sold on the streets) and turned to prose composition. His success in reproducing articles he had read in The Spectator led him to write an article for his brother's paper, which he slipped under the door of the printing shop with no name attached, and which was printed and attracted some attention. After repeated successes of the same sort Benjamin threw off his disguise and contributed regularly to the Courant. When, after various journalistic indiscretions, James Franklin in 1722 was forbidden to publish the Courant, it appeared with Benjamin's name as that of the publisher and was received with much favor, chiefly because of the cleverness of his articles signed "Dr. Janus", which, like those previously signed "Mistress Silence Dogood", gave promise of "Poor Richard." But Benjamin's management of the paper, and particularly his freethinking, displeased the authorities; the relations of the two brothers gradually grew unfriendly, possibly, as Benjamin thought, because of his brother's jealousy of his superior ability; and Benjamin determined to quit his brothers employ and to leave New England. He made his way first to New York City, and then (October 1723) to Philadelphia, where he got employment with a printer named Samuel Keimer. A rapid composer and a workman full of resource, Franklin was soon recognized as the master spirit of the shop. Sir William Keith (1680-1749), governor of the province, urged him to start in business for himself, and when Franklin had unsuccessfully appealed to his father for the means to do so, Keith promised to furnish him with what he needed for the equipment of a new printing office and sent him to England to buy the materials. Keith had repeatedly promised to send a letter of credit by the ship on which Franklin sailed, but when the Channel was reached and the ship's mails were examined no such letter was found. Franklin reached London in December 1724, and found employment first at Palmer's, a famous printing house in Bartholomew Close, and afterwards at Watts's Printing House. At Palmer's he had set up a second edition of William Wollaston's Religion of Nature Delineated. To refute this book and to prove that there could be no such thing as religion, he wrote and printed a small pamphlet, A Dissertation on Liberty and Necessity, Pleasure and Pain, which brought him some curious acquaintances, and of which he soon became thoroughly ashamed. After a year and a half in London, Franklin was persuaded by a friend named Denham, a Quaker merchant, to return with him to America and engage in mercantile business; he accordingly gave up printing, but a few days before sailing he received a tempting offer to remain and give lessons in swimming -- his feats as a swimmer having given him considerable reputation -- and he says that he might have consented "had the overtures been sooner made." He reached Philadelphia in October 1726, but a few months later Denham died, and Franklin was induced by large wages to return to his old employer Keimer; with Keimer he quarrelled repeatedly, thinking himself ill used and kept only to train apprentices until they could in some degree take his place. In 1728 Franklin and Hugh Meredith, a fellow worker at Keimer's, set up in business for themselves; the capital being furnished by Meredith's father. In 1730 the partnership was dissolved, and Franklin, through the financial assistance of two friends, secured the sole management of the printing house. In September 1729 he bought at a merely nominal price The Pennsylvania Gazette, a weekly newspaper which Keimer had started nine months before to defeat a similar project of Franklin's, and which Franklin conducted until 1765. Franklin's superior management of the paper, his new type, "some spirited remarks" on the controversy between the Massachusetts assembly and Governor Burnet, brought his paper into immediate notice, and his success both as a printer and as a journalist was assured and complete. In 1731 he established in Philadelphia one of the earliest circulating libraries in America (often said to have been the earliest), and in 1732 he published the first of his Almanacks, under the pseudonym of Richard Saunders. These "Poor Richard's Almanacks" were issued for the next twenty-five years with remarkable success, the annual sale averaging 10,000 copies, and far exceeding the sale of any other publication in the colonies. Beginning in 1733 Franklin taught himself enough French, Italian, Spanish and Latin to read these languages with some ease. In 1736 he was chosen clerk of the General Assembly, and served in this capacity until 1751. In 1737 he had been appointed postmaster at Philadelphia, and about the same time he organized the first police force and fire company in the colonies; in 1749, after he had written Proposals Relating to the Education of Youth in Pensilvania, he and twenty-three other citizens of Philadelphia formed themselves into an association for the purpose of establishing an academy, which was opened in 1751, was chartered in 1753, and eventually became the University of Pennsylvania; in 1727 he organized a debating club, the "Junto", in Philadelphia, and later he was one of the founders of the American Philosophical Society (1743; incorporated 1780); he took the lead in the organization of a militia force, and in the paving of the city streets, improved the method of street lighting, and assisted in the founding of a city hospital (1751); in brief, he gave the impulse to nearly every measure or project for the welfare and prosperity of Philadelphia undertaken in his day. In 1751 he became a member of the General Assembly of Pennsylvania, in which he served for thirteen years. In 1753 he and William Hunter were put in charge of the post service of the colonies, which he brought in the next ten years to a high state of efficiency and made a financial success; this position he held until 1774. He visited nearly every post office in the colonies and increased the mail service between New York and Philadelphia from once to three times a week in summer, and from twice a month to once a week in winter. When war with France appeared imminent in 1754, Franklin was sent to the Albany Convention, where he submitted his plan for colonial union. When the home government sent over General Edward Braddock with two regiments of British troops, Franklin undertook to secure the requisite number of horses and wagons for the march against Ft. Duquesne, and became personally responsible for payment to the Pennsylvanians who furnished them. Notwithstanding the alarm occasioned by Braddock's defeat, the old quarrel between the proprietors of Pennsylvania and the assembly prevented any adequate preparations for defense; "with incredible meanness" the proprietors had instructed their governors to approve no act for levying the necessary taxes, unless the vast estates of the proprietors were by the same act exempted. So great was the confidence in Franklin in this emergency that early in 1756 the governor of Pennsylvania placed him in charge of the northwestern frontier of the province, with power to raise troops issue commissions and erect blockhouses; and Franklin remained in the wilderness for over a month, superintending the building of forts and watching the Indians. In February 1757 the assembly, "finding the proprietary obstinately persisted in manacling their deputies with instructions inconsistent not only with the privileges of the people, but with the service of the crown, resolv'd to petition the king against them", and appointed Franklin as their agent to present the petition. He arrived in London on the 27th of July 1757, and shortly afterwards, when, at a conference with Earl Granville, president of the council, the latter declared that "the King is the legislator of the colonies", Franklin in reply declared that the laws of the colonies were to be made by their assemblies, to be passed upon by the king, and when once approved were no longer subject to repeal or amendment by the crown. As the assemblies, said he, could not make permanent laws without the king's consent, "neither could he make a law for them without theirs." This opposition of views distinctly raised the issue between the home government and the colonies. As to the proprietors Franklin succeeded in 1760 in securing an understanding that the assembly should pass an act exempting from taxation the unsurveyed waste lands of the Penn estate, the surveyed waste lands being assessed at the usual rate for other property of that description. Thus the proprietors finally acknowledged the right of the assembly to tax their estates. The success of Franklin's first foreign mission was, therefore, substantial and satisfactory. During this sojourn of five years in England he had made many valuable friends outside of court and political circles, among whom David Hume, William Robertson and Adam Smith were conspicuous. In 1759, for his literary and more particularly his scientific attainments, he received the freedom of the city of Edinburgh and the degree of doctor of laws from the university of St. Andrews. He had been made a Master of Arts at Harvard and at Yale in 1753, and at the college of William and Mary in 1756; and in 1762 he received the degree of D.C.L. at Oxford. While in England he had made active use of his remarkable talent for pamphleteering. In the clamor for peace following the death of George II (25th of October 1760), he was for a vigorous prosecution of the war with France; he had written what purported to be a chapter from an old book written by a Spanish Jesuit, On the Meanes of Disposing the Enemie to Peace, which had a great effect; and in the spring of 1760 there had been published a more elaborate paper written by Franklin with the assistance of Richard Jackson, agent of Massachusetts and Connecticut in London, entitled The Interest of Great Britain Considered with Regard to Her Colonies, and the Acquisitions of Canada and Guadeloupe (1760). This pamphlet answered the argument that it would be unsafe to keep Canada because of the added strength that would thus be given to any possible movement for independence in the English colonies, by urging that so long as Canada remained French there could be no safety for the English colonies in North America, nor any permanent peace in Europe. Tradition reports that this pamphlet had considerable weight in determining the ministry to retain Canada. 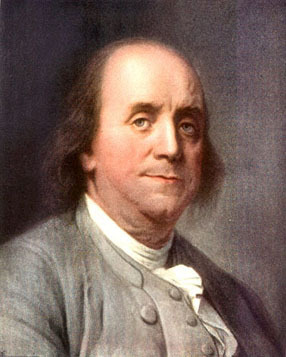 Franklin sailed again for America in August 1762, hoping to be able to settle down in quiet and devote the remainder of his life to experiments in physics. This quiet was interrupted, however, by the "Paxton Massacre" (December 14, 1763) -- the slaughter of a score of Indians (children, women and old men) at Lancaster, Pennsylvania, by some young rowdies from the town of Paxton, who then marched upon Philadelphia to kill a few Christian Indians there. Franklin, appealed to by the governor, raised a troop sufficient to frighten away the "Paxton boys", and for the moment there seemed a possibility of an understanding between Franklin and the proprietors. But the question of taxing the estates of the proprietors came up in a new form, and a petition from the assembly was drawn by Franklin, requesting the king "to resume the government" of Pennsylvania. In the autumn election of 1764 the influence of the proprietors was exerted against Franklin, and by an adverse majority of 25 votes in 4000 he failed to be re-elected to the assembly. The new assembly sent Franklin again to England as its special agent to take charge of another petition for a change of government which, however, came to nothing. Matters of much greater consequence soon demanded Franklin's attention. Early in 1764 Lord Grenville had informed the London agents of the American colonies that he proposed to lay a portion of the burden left by the war with France upon the shoulders of the colonists by means of a stamp duty, unless some other tax equally productive and less inconvenient were proposed. The natural objection of the colonies, as voiced, for example, by the assembly of Pennsylvania, was that it was a cruel thing to tax colonies already taxed beyond their strength, and surrounded by enemies and exposed to constant expenditures for defense, and that it was an indignity that they should be taxed by a parliament in which they were not represented; at the same time the Pennsylvania assembly recognized it as "their duty to grant aid to the crown, according to their abilities, whenever required of them in the usual manner." To prevent the introduction of the Stamp Act, which he characterized as "the mother of mischief", Franklin used every effort, but the bill was easily passed, and it was thought that the colonists would soon be reconciled to it. Because he, too, thought so, and because he recommended John Hughes, a merchant of Philadelphia, for the office of distributor of stamps, Franklin himself was denounced -- he was even accused of having planned the Stamp Act -- and his family in Philadelphia was in danger of being mobbed. Of Franklin's examination, in February 1766, by the House in Committee of the Whole, as to the effects of the Stamp Act, Edmund Burke said that the scene reminded him of a master examined by a parcel of schoolboys, and George Whitefield said: "Dr. Franklin has gained immortal honor by his behavior at the bar of the House. His answer was always found equal to the questioner. He stood unappalled, gave pleasure to his friends and did honor to his country." Franklin compared the position of the colonies to that of Scotland in the days before the union, and in the same year (1766) audaciously urged a similar union with the colonies before it was too late. The knowledge of colonial affairs gained from Franklin's testimony, probably more than all other causes combined, determined the immediate repeal of the Stamp Act. For Franklin this was a great triumph, and the news of it filled the colonists with delight and restored him to their confidence and affection. Another bill (the Declaratory Act), however, was almost immediately passed by the king's party, asserting absolute supremacy of parliament over the colonies, and in the succeeding parliament, by the Townshend Acts of 1767, duties were imposed on paper, paints and glass imported by the colonists; a tax was imposed on tea also. The imposition of these taxes was bitterly resented in the colonies, where it quickly crystallized public opinion around the principle of "No taxation without representation." In spite of the opposition in the colonies to the Declaratory Act, the Townshend Acts and the tea tax, Franklin continued to assure the British ministry and the British public of the loyalty of the colonists. He tried to find some middle ground of reconciliation, and kept up his quiet work of informing England as to the opinions and conditions of the colonies, and of moderating the attitude of the colonies toward the home government; so that, as he said, he was accused in America of being too much an Englishman, and in England of being too much an American. He was agent now, not only of Pennsylvania, but also of New Jersey, of Georgia and of Massachusetts. Hillsborough, who became secretary of state for the colonies in 1768, refused to recognize Franklin as agent of Massachusetts, because the governor of Massachusetts had not approved the appointment, which was by resolution of the assembly. Franklin contended that the governor, as a mere agent of the king, could have nothing to do with the assembly's appointment of its agent to the king; that "the King, and not the King, Lords, and Commons collectively, is their sovereign; and that the King, with their respective Parliaments, is their only legislator." Franklin's influence helped to oust Hillsborough, and Dartmouth, whose name Franklin suggested, was made secretary in 1772 and promptly recognized Franklin as the agent of Massachusetts. In 1773 there appeared in the Public Advertiser one of Franklin's cleverest hoaxes, "An Edict of the King of Prussia", proclaiming that the island of Britain was a colony of Prussia, having been settled by Angles and Saxons, having been protected by Prussia, having been defended by Prussia against France in the war just past, and never having been definitely freed from Prussia's rule; and that, therefore, Great Britain should now submit to certain taxes laid by Prussia -- the taxes being identical with those laid upon the American colonies by Great Britain. In the same year occurred the famous episode of the Hutchinson Letters. These were written by Thomas Hutchinson, Governor of Massachusetts, Andrew Oliver (1706-1774), his lieutenant-governor, and others to William Whately, a member of Parliament, and private secretary to George Grenville, suggesting an increase of the power of the governor at the expense of the assembly, "an abridgement of what are called English liberties", and other measures more extreme than those undertaken by the government. The correspondence was shown to Franklin by a mysterious "member of parliament" to back up the contention that the quartering of troops in Boston was suggested, not by the British ministry, but by Americans and Bostonians. Upon his promise not to publish the letters Franklin received permission to send them to Massachusetts, where they were much passed about and were printed, and they were soon republished in English newspapers. The Massachusetts assembly on receiving the letters resolved to petition the crown for the removal of both Hutchinson and Oliver. The petition was refused and was condemned as scandalous, and Franklin, who took upon himself the responsibility for the publication of the letters, in the hearing before the privy council at the Cockpit on the 29th of January 1774 was insulted and was called a thief by Alexander Wedderburn (the solicitor-general, who appeared for Hutchinson and Oliver), and was removed from his position as head of the post office in the American colonies. Satisfied that his usefulness in England was at an end, Franklin entrusted his agencies to the care of Arthur Lee, and on the 21st of March 1775 again set sail for Philadelphia. During the last years of his stay in England there had been repeated attempts to win him (probably with an under-secretaryship) to the British service, and in these same years he had done a great work for the colonies by gaining friends for them among the opposition, and by impressing France with his ability and the excellence of his case. Upon reaching America, he heard of the fighting at Lexington and Concord, and with the news of an actual outbreak of hostilities his feeling toward England seems to have changed completely. He was no longer a peacemaker, but an ardent warmaker. On the 6th of May, the day after his arrival in Philadelphia, he was elected by the assembly of Pennsylvania a delegate to the Continental Congress in Philadelphia. In October he was elected a member of the Pennsylvania assembly, but, as members of this body were still required to take an oath of allegiance to the crown, he refused to serve. In the Congress he served on as many as ten committees, and upon the organization of a continental postal system, he was made postmaster-general, a position he held for one year, when (in 1776) he was succeeded by his son-in-law, Richard Bache, who had been his deputy. With Benjamin Harrison, John Dickinson, Thomas Johnson and John Jay he was appointed in November 1775 to a committee to carry on a secret correspondence with the friends of America "in Great Britain, Ireland and other parts of the world." He planned an appeal to the king of France for aid, and wrote the instructions of Silas Deane who was to convey it. In April 1776 he went to Montreal with Charles Carroll, Samuel Chase and John Carroll, as a member of the commission which conferred with General Benedict Arnold, and attempted without success to gain the cooperation of Canada. Immediately after his return from Montreal he was a member of the committee of five appointed to draw up the Declaration of Independence, but he took no actual part himself in drafting that instrument, aside from suggesting the change or insertion of a few words in Thomas Jefferson's draft. From July 16 to September 28 he acted as president of the Constitutional Convention of Pennsylvania. With John Adams and Edward Rutledge he was selected by Congress to discuss with Admiral Howe (September 1776, at Staten Island) the terms of peace proposed by Howe, who had arrived in New York harbor in July 1776, and who had been an intimate friend of Franklin; but the discussion was fruitless, as the American commissioners refused to treat "back of this step of independency." On the 26th of September in the same year Franklin was chosen as commissioner to France to join Arthur Lee, who was in London, and Silas Deane, who had arrived in France in June 1776. He collected all the money he could command, between �3000 and �4000, lent it to Congress before he set sail, and arrived at Paris on the 22nd of December. He found quarters at Passy, then a suburb of Paris, in a house belonging to Le Ray de Chaumont, an active friend of the American cause, who had influential relations with the court, and through whom he was enabled to be in the fullest communication with the French government without compromising it in the eyes of Great Britain. At the time of Franklin's arrival in Paris he was already one of the most talked about men in the world. He was a member of every important learned society in Europe; he was a member, and one of the managers, of the Royal Society, and was one of eight foreign members of the Royal Academy of Sciences in Paris. Three editions of his scientific works had already appeared in Paris, and a new edition had recently appeared in London. To all these advantages he added a political purpose -- the dismemberment of the British empire -- which was entirely congenial to every citizen of France. "Franklin's reputation", wrote John Adams with characteristic extravagance, "was more universal than that of Leibniz or Newton, Frederick or Voltaire; and his character more esteemed and beloved than all of them... If a collection could be made of all the gazettes of Europe, for the latter half of the 18th century, a greater number of panegyrical paragraphs upon le grand Franklin would appear, it is believed, than upon any other man that ever lived." "Franklin's appearance in the French salons, even before he began to negotiate", says Friedrich Christoph Schlosser, "was an event of great importance to the whole of Europe... His dress, the simplicity of his external appearance, the friendly meekness of the old man, and the apparent humility of the Quaker, procured for Freedom a mass of votaries among the court circles who used to be alarmed at its coarseness and unsophisticated truths. Such was the number of portraits, busts and medallions of him in circulation before he left Paris that he would have been recognized from them by any adult citizen in any part of the civilized world." Franklin's position in France was a difficult one from the start, because of the delicacy of the task of getting French aid at a time when France was unready openly to take sides against Great Britain. But on the 6th of February 1778, after the news of the defeat and surrender of Burgoyne had reached Europe, a treaty of alliance and a treaty of amity and commerce between France and the United States were signed at Paris by Franklin, Deane and Lee. On the 28th of October this commission was discharged and Franklin was appointed sole plenipotentiary to the French court. Lee, from the beginning of the mission to Paris, seems to have been possessed of a mania of jealousy toward Franklin, or of misunderstanding of his acts, and he tried to undermine his influence with the Continental Congress. John Adams, when he succeeded Deane (recalled from Paris through Lee's machinations) joined in the chorus of fault-finding against Franklin, dilated upon his social habits, his personal slothfulness and his complete lack of business-like system; but Adams soon came to see that, although careless of details, Franklin was doing what no other man could have done, and he ceased his harsher criticism. Even greater than his diplomatic difficulties were Franklin's financial straits. Drafts were being drawn on him by all the American agents in Europe, and by the Continental Congress at home. Acting as American naval agent for the many successful privateers who harried the English Channel, and for whom he skilfully got every bit of assistance possible, open and covert, from the French government, he was continually called upon for funds in these ventures. Of the vessels to be sent to Paris with American cargoes which were to be sold for the liquidation of French loans to the colonies made through Beaumarchais, few arrived; those that did come did not cover Beaumarchais's advances, and hardly a vessel came from America without word of fresh drafts on Franklin. After bold and repeated overtures for an exchange of prisoners -- an important matter, both because the American frigates had no place in which to stow away their prisoners, and because of the maltreatment of American captives in such prisons as Dartmoor -- exchanges began at the end of March 1779, although there were annoying delays, and immediately after November 1781 there was a long break in the agreement; and the Americans discharged from English prisons were constantly in need of money. Franklin, besides, was constantly called upon to meet the indebtedness of Lee and of Ralph Izard (1742-1804), and of John Jay, who in Madrid was being drawn on by the American Congress. In spite of the poor condition in Europe of the credit of the struggling colonies, and of the fact that France was almost bankrupt (and in the later years was at war), and although Necker strenuously resisted the making of any loans to the colonies, France, largely because of Franklin's appeals, expended, by loan or gift to the colonies, or in sustenance of the French arms in America, a sum estimated at $60,000,000. In 1781 Franklin, with John Adams, John Jay, Jefferson, who remained in America, and Henry Laurens, then a prisoner in England, was appointed on a commission to make peace with Great Britain. In the spring of 1782 Franklin had been informally negotiating with Shelburne, secretary of state for the home department, through the medium of Richard Oswald, a Scotch merchant, and had suggested that England should cede Canada to the United States in return for the recognition of loyalist claims by the states. When the formal negotiations began Franklin held closely to the instructions of Congress to its commissioners, that they should maintain confidential relations with the French ministers and that they were "to undertake nothing in the negotiations for peace or truce without their knowledge and concurrence", and were ultimately to be governed by "their advice and opinion." Jay and Adams disagreed with him on this point, believing that France intended to curtail the territorial aspirations of the Americans for her own benefit and for that of her ally, Spain. At last, after the British government had authorized its agents to treat with the commissioners as representatives of an independent power, thus recognizing American independence before the treaty was made, Franklin acquiesced in the policy of Jay. The preliminary treaty was signed by the commissioners on the 30th of November 1782, the final treaty on the 3rd of September 1783. Franklin had repeatedly petitioned Congress for his recall, but his letters were unanswered or his appeals refused until the 7th of March 1785, when Congress resolved that he be allowed to return to America; on the 10th of March Thomas Jefferson, who had joined him in August of the year before, was appointed to his place. Jefferson, when asked, if he replaced Franklin, replied, "No one can replace him, sir; I am only his successor." Before Franklin left Paris on the 12th of July 1785 he had made commercial treaties with Sweden (1783) and Prussia (1785; signed after Franklin's departure by Jefferson and John Adams). Franklin arrived in Philadelphia on the 13th of September, disembarking at the same wharf as when he had first entered the city. He was immediately elected a member of the municipal council of Philadelphia, becoming its chairman; and was chosen president of the Supreme Executive Council (the chief executive officer) of Pennsylvania, and was re-elected in 1786 and 1787, serving from October 1785 to October 1788. In May 1787 he was elected a delegate to the Convention which drew up the Federal Constitution, this body thus having a member upon whom all could agree as chairman, should George Washington be absent. He opposed over-centralization of government and favored the Connecticut Compromise, and after the work of the Convention was done used his influence to secure the adoption of the Constitution. As president of the Pennsylvania Society for Promoting the Abolition of Slavery, Franklin signed a petition to Congress (12th February 1790) for immediate abolition of slavery, and six weeks later in his most brilliant manner parodied the attack on the petition made by James Jackson (1757-1806) of Georgia, taking off Jackson's quotations of Scripture with pretended texts from the Koran cited by a member of the Divan of Algiers in opposition to a petition asking for the prohibition of holding Christians in slavery. These were his last public acts. His last days were marked by a fine serenity and calm; he died in his own house in Philadelphia on the 17th of April 1790, the immediate cause being an abscess in the lungs. He was buried with his wife in the graveyard (Fifth and Arch Streets) of Christ Church, Philadelphia. Physically Franklin was large, about 5 feet 10 inches tall, with a well-rounded, powerful figure; he inherited an excellent constitution from his parents -- "I never knew", says he, "either my father or mother to have any sickness but that of which they dy'd, he at 89, and she at 85 years of age" -- but injured it somewhat by excesses; in early life he had severe attacks of pleurisy, from one of which, in 1727, it was not expected that he would recover, and in his later years he was the victim of stone and gout. When he was sixteen he became a vegetarian for a time, rather to save money for books than for any other reason, and he always preached moderation in eating, though he was less consistent in his practice in this particular than as regards moderate drinking. He was always enthusiastically fond of swimming, and was a great believer in fresh air, taking a cold air bath regularly in the morning, when he sat naked in his bedroom beguiling himself with a book or with writing for a half-hour or more. He insisted that fresh, cold air was not the cause of colds, and preached zealously the "gospel of ventilation." He was a charming talker, with a gay humor and a quiet sarcasm and a telling use of anecdote for argument. Henri Martin, the French historian, speaks of him as "of a mind altogether French in its grace and elasticity." In 1730 he married Deborah Read, in whose father's house he had lived when he had first come to Philadelphia, to whom he had been engaged before his first departure from Philadelphia for London, and who in his absence had married a ne'er-do-well, one Rogers, who had deserted her. The marriage to Franklin is presumed to have been a common law marriage, for there was no proof that Miss Read's former husband was dead, nor that, as was suspected, a former wife, alive when Rogers married Miss Read, was still alive, and that therefore his marriage to Deborah was void. His "Debby", or his "dear child", as Franklin usually addressed her in his letters, received into the family, soon after her marriage, Franklin's illegitimate son, William Franklin, with whom she afterwards quarrelled, and whose mother, tradition says, was Barbara, a servant in the Franklin household. Another illegitimate child became the wife of John Foxcroft of Philadelphia. Deborah, who was "as much dispos'd to industry and frugality as" her husband, was illiterate and shared none of her husband's tastes for literature and science; her dread of an ocean voyage kept her in Philadelphia during Franklin's missions to England, and she died in 1774, while Franklin was in London. She bore him two children, one a son, Francis Folger, "whom I have seldom since seen equal'd in everything, and whom to this day [thirty-six years after the child's death] I cannot think of without a sigh", who died (1736) when four years old of smallpox, not having been inoculated; the other was Sarah (1744-1808), who married Richard Bache (1737-1811), Franklin's successor in 1776-82 as postmaster-general. Franklin's gallant relations with women after his wife's death were probably innocent enough. Best known of his French amies were Mme. Helvetius, widow of the philosopher, and the young Mme. Brillon, who corrected her "Papa's" French and tried to bring him safely into the Roman Catholic Church. With him in France were his grandsons, William Temple Franklin, William Franklin's natural son, who acted as private secretary to his grandfather, and Benjamin Franklin Bache (1769-1798), Sarah's son, whom he sent to Geneva to be educated, for whom he later asked public office of Washington, and who became editor of the Aurora, one of the leading journals in the Republican attacks on Washington. Franklin early rebelled against New England Puritanism and spent his Sundays in reading and in study instead of attending church. His freethinking ran its extreme course at the time of his publication in London of A Dissertation on Liberty and Necessity, Pleasure and Pain (1725), which he recognized as one of the great errata of his life. He later called himself a deist, or theist, not discriminating between the terms. To his favorite sister he wrote: "There are some things in your New England doctrine and worship which I do not agree with; but I do not therefore condemn them, or desire to shake your belief or practice of them." Such was his general attitude. He did not believe in the divinity of Christ, but thought "his system of morals and his religion, as he left them to us, the best the world ever saw, or is like to see." His intense practical-mindedness drew him away from religion, but drove him to a morality of his own (the "art of virtue," he called it), based on thirteen virtues each accompanied by a short precept; the virtues were Temperance, Silence, Order, Resolution, Frugality, Industry, Sincerity, Justice, Moderation, Cleanliness, Tranquility, Chastity and Humility, the precept accompanying the last-named virtue being "Imitate Jesus and Socrates." He made a business-like little notebook, ruled off spaces for the thirteen virtues and the seven days of the week, "determined to give a week's strict attention to each of the virtues successively... [going] thro' a course compleate in thirteen weeks and four courses in a year", marking for each day a record of his adherence to each of the precepts. "And conceiving God to be the fountain of wisdom", he "thought it right and necessary to solicit His assistance for obtaining it", and drew up the following prayer for daily use: "O powerful Goodness! bountiful Father! merciful Guide! Increase in me that wisdom which discovers my truest interest. Strengthen my resolution to perform what that wisdom dictates. Accept my kind offices to Thy other children, as the only return in my power for Thy continual favors to me." He was by no means prone to overmuch introspection, his great interest in the conduct of others being shown in the wise maxims of Poor Richard, which were possibly too utilitarian but were wonderfully successful in instructing American morals. His Art of Virtue on which he worked for years was never completed or published in any form. "Benjamin Franklin, Printer", was Franklin's own favorite description of himself. He was an excellent compositor and pressman; his workmanship, clear impressions, black ink and comparative freedom from errata did much to get him the public printing in Pennsylvania and New Jersey, and the printing of the paper money and other public matters in Delaware. The first book with his imprint is The Psalms of David Imitated in the Language of the New Testament and apply'd to the Christian State and Worship. By I. Watts..., Philadelphia: Printed by B. F. and H. M. for Thomas Godfrey, and Sold at his Shop, 1729. The first novel printed in America was Franklin's reprint in 1744 of Samuel Richardson's Pamela; and the first American translation from the classics which was printed in America was a version by James Logan (1674-1751) of Dionysius Cato's Moral Distichs (1735). In 1744 he published another translation of Logan's, Cicero On Old Age, which Franklin thought typographically the finest book he had ever printed. In 1733 he had established a press in Charleston, South Carolina, and soon after did the same in Lancaster, Pennsylania, in New Haven, Connecticut, in New York, in Antigua, in Kingston, Jamaica, and in other places. Personally he had little connection with the Philadelphia printing office after 1748, when David Hall became his partner and took charge of it. But in 1753 he was eagerly engaged in having several of his improvements incorporated in a new press, and more than twenty years after was actively interested in John Walter's scheme of "logography." In France he had a private press in his house in Passy, on which he printed "bagatelles." Franklin's work as a publisher is for the most part closely connected with his work in issuing the Gazette and Poor Richard's Almanack (a summary of the proverbs from which appeared in the number for 1758, and has often been reprinted -- under such titles as Father Abraham's Speech, and The Way to Wealth). Of much of Franklin's work as an author something has already been said. Judged as literature, the first place belongs to his Autobiography, which unquestionably ranks among the few great autobiographies ever written. His style in its simplicity, facility and clearness owed something to Daniel Defoe, something to Cotton Mather, something to Plutarch, more to John Bunyan and to his early attempts to reproduce the manner of the third volume of the Spectator; and not the least to his own careful study of word usage. From Xenophon's Memorabilia he learned when a boy the Socratic method of argument. Jonathan Swift he resembled in the occasional broadness of his humor, in his brilliantly successful use of sarcasm and irony, and in his mastery of the hoax. Honor� de Balzac said of him that he "invented the lightning-rod, the hoax ('le canard') and the republic." Among his more famous hoaxes were the "Edict of the King of Prussia" (1773), already described; the fictitious supplement to the Boston Chronicle, printed on his private press at Passy in 1782, and containing a letter with an invoice of eight packs of 954 cured, dried, hooped and painted scalps of rebels, men, women and children, taken by Indians in the British employ; and another fictitious Letter from the Count de Schaumberg to the Baron Hohendorf commanding the Hessian Troops in America (1777) -- the count's only anxiety is that not enough men will be killed to bring him in moneys he needs, and he urges his officer in command in America "to prolong the war... for I have made arrangements for a grand Italian opera, and I do not wish to be obliged to give it up." Closely related to Franklin's political pamphlets are his writings on economics, which, though undertaken with a political or practical purpose and not in a purely scientific spirit, rank him as the first American economist. He wrote in 1729 A Modest Enquiry into the Nature and Necessity of a Paper Currency, which argued that a plentiful currency will make rates of interest low and will promote immigration and home manufactures, and which did much to secure the further issue of paper money in Pennsylvania. After the British Act of 1750 forbidding the erection or the operating of iron or steel mills in the colonies, Franklin wrote Observations concerning the Increase of Mankind and the Peopling of Countries (1751); its thesis was that manufactures come to be common only with a high degree of social development and with great density of population, and that Great Britain need not, therefore, fear the industrial competition of the colonies, but it is better known for the estimate (adopted by Adam Smith) that the population of the colonies would double every quarter-century; and for the likeness to Thomas Malthus's "preventive check" of its statement: "The greater the common fashionable expense of any rank of people the more cautious they are of marriage." His Positions to be examined concerning National Wealth (1769) shows that he was greatly influenced by the French physiocrats after his visit to France in 1767. His Wail of a Protected Manufacturer voices a protest against protection as raising the cost of living; and he held that free trade was based on a natural right. He knew Kames, Hume and Adam Smith, and corresponded with Mirabeau, "the friend of Man." Some of the more important of his economic theses, as summarized by W. A. Wetzel, are: that money as coin may have more than its bullion value; that natural interest is determined by the rent of land valued at the sum of money loaned -- an anticipation of Turgot; that high wages are not inconsistent with a large foreign trade; that the value of an article is determined by the amount of labor necessary to produce the food consumed in making the article; that manufactures are advantageous but agriculture only is truly productive; and that when practicable (as he did not think it practicable at the end of the War of Independence) state revenue should be raised by direct tax. Franklin as a scientist and as an inventor has been decried by experts as an amateur and a dabbler; but it should be remembered that it was always his hope to retire from public life and devote himself to science. In the American Philosophical Society (founded 1743) scientific subjects were much discussed. Franklin wrote a paper on the causes of earthquakes for his Gazette of the 15th of December 1737; and he eagerly collected material to uphold his theory that waterspouts and whirlwinds resulted from the same causes. In 1743, from the circumstance that an eclipse not visible in Philadelphia because of a storm had been observed in Boston, where the storm although northeasterly did not occur until an hour after the eclipse, he surmised that storms move against the wind along the Atlantic coast. In the year before (1742) he had planned the "Pennsylvania fire-place", better known as the "Franklin stove", which saved fuel, heated all the room, and had the same principle as the hot-air furnace; the stove was never patented by Franklin, but was described in his pamphlet dated 1744. He was much engaged at the same time in remedying smoking chimneys, and as late as 1785 wrote to Jan Ingenhousz, physician to the emperor of Austria, on chimneys and draughts; smoking street lamps he remedied by a simple contrivance. The study of electricity he took up in 1746 when he first saw a Leyden jar, in the manipulation of which he became expert and which he improved by the use of granulated lead in the place of water for the interior armatures; he recognized that condensation is due to the dielectric and not to the metal coatings. A note in his diary, dated the 7th of November 1749, shows that he had then conjectured that thunder and lightning were electrical manifestations; in the same year he planned the lightning-rod (long known as "Franklin's rod"), which he described and recommended to the public in 1752, when the Copley medal of the Royal Society was awarded him for his discoveries. The famous experiment with the kite, proving lightning an electrical phenomenon, was performed by Franklin in June 1752. He overthrew entirely the "friction" theory of electricity and conceived the idea of plus and minus charges (1753); he thought the sea the source of electricity. On light Franklin wrote to David Rittenhouse in June 1784; the sum of his own conjectures was that the corpuscular theory of Isaac Newton was wrong, and that light was due to the vibration of an elastic aether. He studied with some care the temperature of the Gulf Stream. In navigation he suggested many new contrivances, such as watertight compartments, floating anchors to lay a ship to in a storm, and dishes that would not upset during a gale; and beginning in 1757 made repeated experiments with oil on stormy waters. As a mathematician he devised various elaborate magic squares and novel magic circles, of which he speaks apologetically, because they are of no practical use. Always much interested in agriculture, he made a special effort (like Robert R. Livingston) to promote the use of plaster of Paris as a fertilizer. He took a prominent part in aeronautical experiments during his stay in France. He made an excellent clock, which because of a slight improvement introduced by James Ferguson in 1757 was long known as Ferguson's clock. In medicine Franklin was considered important enough to be elected to the Royal Medical Society of Paris in 1777, and an honorary member of the Medical Society of London in 1787. In 1784 he was on the committee which investigated Franz Anton Mesmer, and the report is a document of lasting scientific value. Franklin's advocacy of vegetarianism, of sparing and simple diet, and of temperance in the use of liquors, and of proper ventilation has already been referred to. His most direct contribution to medicine was the invention for his own use of bifocal eyeglasses. A summary of so versatile a genius is impossible. His services to America in England and France rank him as one of the heroes of the American War of Independence and as the greatest of American diplomats. Almost the only American scientist of his day, he displayed remarkably deep as well as remarkably varied abilities in science and deserved the honors enthusiastically given him by the savants of Europe. Franklin's works were not collected in his own lifetime, and he made no effort to publish his writings. Experiments and Observations on Electricity (London, 1769) was translated into French by Barbeu Dubourg (Paris, 1773); Vaughan attempted a more complete edition, Political, Miscellaneous and Philosophical Pieces (London, 1779); an edition in three volumes appeared after Franklin's death (London, 1806); what seemed the authentic Works, as it was under the care of Temple Franklin, was published at London (6 vols., 1817-19; 3 vols., 1818) and with some additional matter at Philadelphia (6 vols., 1818). Sparks's edition (10 vols., Boston, 1836-42; revised, Philadelphia, 1858) also contained fresh matter; and there are further additions in the edition of John Bigelow (Philadelphia, 1887-88; 5th ed., 1905) and in that by Albert Henry Smyth (10 vols., New York, 1905-07). There are important Frankliniana, about 13,000 papers, in the possession of the American Philosophical Society, to which they were conveyed by the son of Temple Franklin's executor, George Fox. Other papers which had been left to Fox lay for years in barrels in a stable garret; they were finally cleared out, their owner, Mary Fox, intending to send them to a paper mill. One barrel went to the mill. The others, it was found, contained papers belonging to Franklin, and this important collection was bought and presented to the University of Pennsylvania. The valuable Frankliniana collected by Henry Stevens were purchased by Congress in 1885. These manuscript collections were first carefully gone over for the edition of the Works by A. H. Smyth. Franklin's Autobiography was begun in 1771 as a private chronicle for his son, Governor William Franklin; the papers, bringing the story of his father's life down to 1730, were lost by the governor during the War of Independence, and in 1783 came into the possession of Abel James, who restored them to Franklin and urged him to complete the sketch. He wrote a little in 1784, more in 1788, when he furnished a copy to his friend le Veillard, and a little more in 1790. The original manuscript was long in the possession of Temple Franklin, who spent years rearranging the matter in it and making over into politer English his grandfather's plain-spokenness. So long was the publication delayed that it was generally believed that Temple Franklin had sold all the papers to the British government; a French version, M�moires de la vie Priv�e (Paris, 1791), was retranslated into English twice in 1793 (London), and from one of these versions (by Robinson) still another French version was made (Paris, 1798). Temple Franklin, deciding to print, got from le Veillard the copy sent to him in 1788 (sending in return the original with autograph alterations and the final addition), and from the copy published (London, 1817) an edition supposed to be authentic and complete. The complete autograph of the biography, acquired by John Bigelow in 1867 from its French owners, upon collation with Temple Franklin's edition showed that the latter contained 1200 emasculations and that it omitted entirely what had been written in 1790. Bigelow published the complete Autobiography with additions from Franklin's correspondence and other writings in 1868; a second edition (3 vols., Philadelphia, 1888) was published under the title, The Life of Benjamin Franklin, Written by Himself. Old Style, 6 January 1706. New Style, 17 January 1706.